There are computers for all kinds of use cases. Just a decade back, you had to choose between a clunky desktop and an even clunkier laptop. Thankfully, things have changed since then. Today we can choose between a range of smart devices: smartphones, phablets, tablets, laptops, hybrids, desktops, and much more. The choices are virtually unlimited. For serious professional work, I wouldn’t consider smartphones or tablets, or even hybrids for that matter. A super sleek laptop and a powerful desktop will best fit my lifestyle needs. ASUS has asked bloggers to choose between ASUS EeeBook X205TA (a laptop) and ASUS All In One PC ET2040 (a portable desktop) depending on their lifestyles. This blog post is an effort to go through all their main features and check out which one of these two will fit my needs better. This is the first feature I look out for before buying any product. ASUS is known to make solid products. Half of the components in my desktop rig are from ASUS, and they’ve been working flawlessly for years now. So, I would trust them with both these devices. This is a tie. Next up is power. It is hard to compare power of these two devices since they serve different uses. It’s like comparing the power of a large SUV to that of a small hatchback; it just wouldn’t do. However, with that being said, I can still compare their power to what my lifestyle demands. The EeeBook X205TA’s 4th Gen Intel Atom processor is powerful enough for day-to-day tasks when I’m on the move. The All In One PC ET2040 is more powerful than the laptop, but it still cannot outperform my current desktop, which it is intended to replace. So, this round goes to EeeBook, even though it is less powerful. The ASUS EeeBook wins this round hands down. The screen is just 11.6-inches in size, but the laptop also weighs less than 1kg. That’s a huge plus point while lugging it around. If I’m traveling on my motorcycle, to a friend’s place or out of city, which I usually do, which device do you think I’d prefer? I’d choose an ultra-sleek laptop like the EeeBook of course. I’m a freelance writer and a blogger. At home I use a TVS Mechanical keyboard which is excellent for typing. The physical feedback you get after every keystroke is something which I cannot live without. I don’t get the same wonderful feeling when I’m typing on capacitive keyboards, which also includes laptop keyboards. The keyboard on IBM’s ThinkPad series is the closest I’ve come to like on a laptop. Since I’ll be using it only now and then during my travels (or for entertainment purposes in my home), I think the ASUS EeeBook’s keyboard would suffice. The ASUS All In One PC is meant to be used plugged in. It has an in-built battery which lasts for an hour or so, but that’s hardly sufficient for my lifestyle needs. The EeeBook on the other hand has a 2-cell battery which promises up to 12-hour of battery life. I can live with that. In fact, I can run with that. That’s excellent for a laptop that costs less than 15k INR. 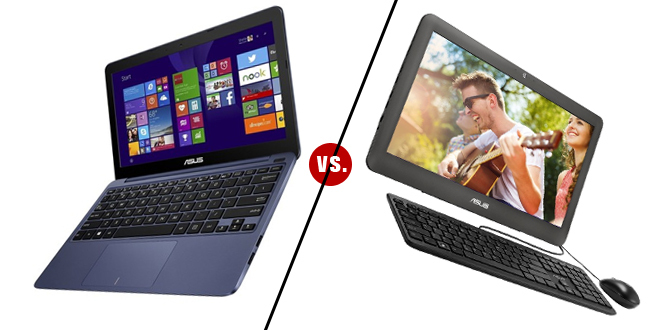 Based on my lifestyle needs, I’d have to go with the ASUS EeeBook X205TA. It’s super-thin, lightweight, portable, can run day-to-day tasks effortlessly, has excellent battery life, and most of all, is value for money. Eccentric, mildly sarcastic, and very straight forward. A geek at heart. Adventure, science, and intelligence excite him. Likes to keep rummaging through random topics in his free time. Always ready to learn, except when he's hungry. Connect with him on Google+, Facebook and Twitter. Get in touch. I’m all ears!